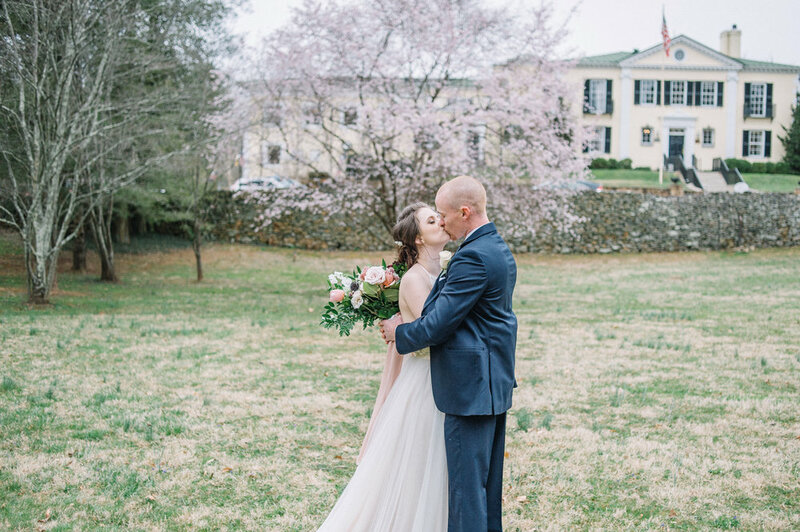 Ali & Nick's wedding at Airlie was SO perfect, despite the cold (& snow!) I was a little nervous with the forecast, but everything went as planned. The ceremony was moved inside of the Jefferson Room-which created the perfect intimate ceremony and the white walls really made everything glow! Afterwards we all braved the cold for the gorgeous photos (which I LOVE SO MUCH!!) it couldn't have gone any better!! Mainstreet Weddings coordinated & designed all the lovely details, Bride and Joy (in Culpeper VA) provided all the pretty rentals and Love Blooms DC blew me away with her gorgeous blooms, Bijou Sweet Treats created the perfect dessert bar/little cake, Nate Clancy (ImTheDj.net) rocked out the dance floor and had everyone dancing through the night and Brooks Gatewood (BE Videography) was a dream to work with as always, I can't wait to see the highlight film of their day and Vintage Veil did an AMAZING job on hair & makeup! It was truly the ultimate dream team for their day!! Enjoy these highlights from their Airlie wedding, I hope you love them as much as I do!